Land-Fast Ice Cover off North Greenland: Will NASA bite? When a large outlet glacier of North Greenland (Petermann Gletscher) discharged an ice island four times the size of Manhattan in August of 2010, the United States’ Congress held formal inquiries on its cause within days of the event. Congressmen, scientists, and the global media speculated that this event and concurrent severe droughts in Russia and floods in Asia were tied to record-breaking air temperatures and global warming. Reviewing available data, Johnson et al. 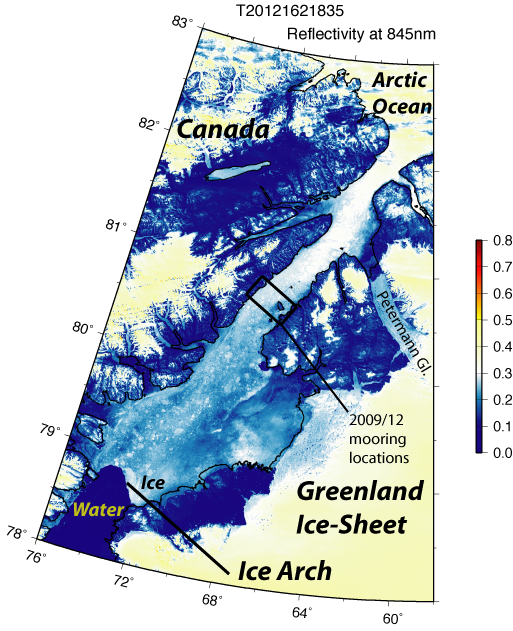 (2011) cautioned that most melting of floating ice shelves such as Petermann Gletscher is dominated by physical ocean processes below, not above the ice (Reeh, 2001, Rignot and Steffen, 2008). The National Journal asked me to write an essay to answer the question: “Is Climate Change Causing Wild Weather?” which I answered with a nerdy No, but …. Motivated by questions asked during the congressional hearing, I showed that waters in Petermann Fjord (a) originate from the Arctic Ocean to the north, (b) contain heat of Atlantic origin, and (c) have warmed significantly since 2003 (Muenchow et al., 2011). Petermann Gletscher from MODIS Terra. 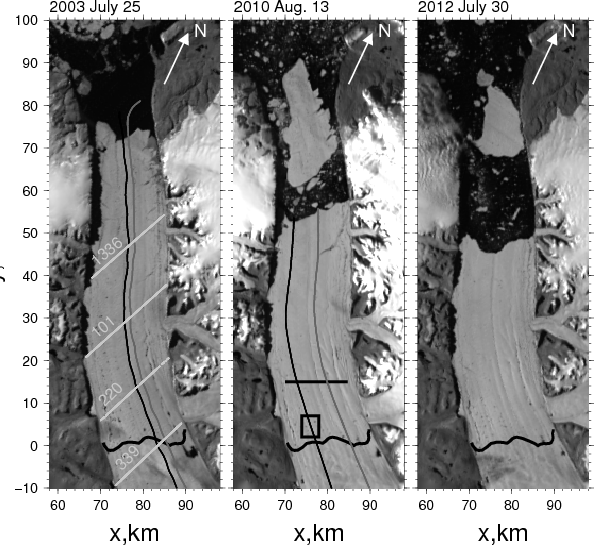 Repeat NASA along-glacier flight tracks are shown in the left and middle panels. White line across the glacier are ICESat tracks. Thick black line across the glacier near y = 0 km is the grounding line location from Rignot and Steffen (2008). Dark areas within 2 km off the western wall are mountain shadows. When I reported here that the same glacier discharged yet another ice island in July 2012, this one “only” twice the size of Manhattan, I was not so sure anymore, that this was merely another extreme event caused by natural processes. Furthermore, only 4 weeks later I was aboard the CCGS Henry Larsen working in Petermann Fjord and Nares Strait to recover instruments that we had deployed in 2009. Witnessing dramatic change off North Greenland from my first visit in 2003 to my last in 2012, I will send NASA a proposal on monday. If suported, it would enable me to test the idea, that a changing sea ice cover off North Greenland over the last 30 years or so relates to the retreat and decay of glaciers north of 76 N latitude. Most of these glaciers connect the Greenland Ice Sheet to the ocean via floating ice shelves as does Petermann. June-10, 2012 MODIS-Terra image showing location of moored array that was deployed in Aug. 2009 and that we recovered in Aug. 2012. 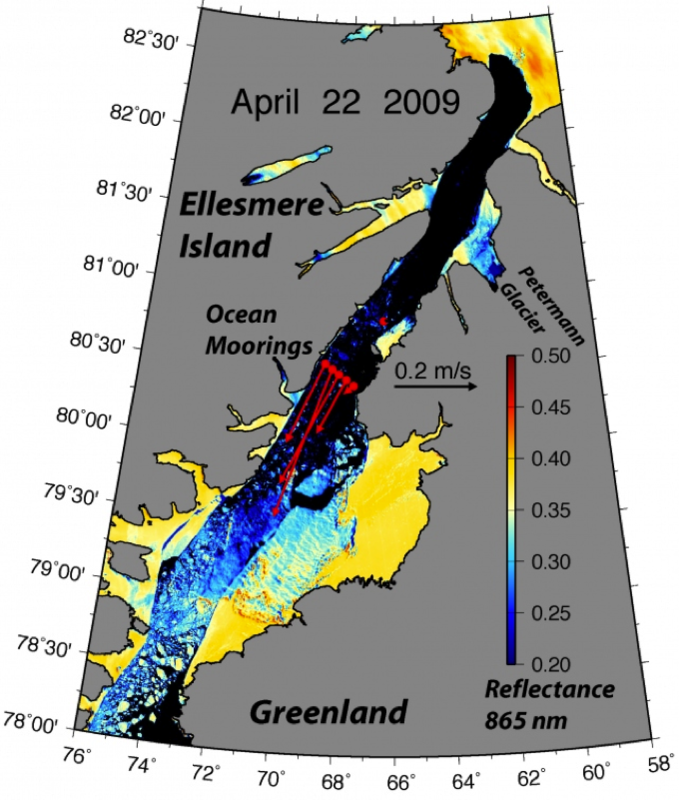 Largely ice-free Nares Strait on April 2009 with concurrent ocean velocity. My main question is this: Has the changing sea ice cover next to glaciers anything to do with the break-up of many large glaciers all around North Greenland that we have observed the last few years? Is the removal of the summer sea ice from the many fjords of North Greenland a normal occurrence or is this a new regime that flushes many fjords free of ice in summer? Does the available record of air and ocean observations allow us to explain observed change? I believe that the public has all the data (MODIS, SSM/I, ICESat, etc) to answer these questions, but it will need a little work to actually provide quantifiable answers with error bars to pass academic peer review. Anyone is more than welcome to help and maybe even learn or apply skills for a graduate degree and well-paying jobs in physics or engineering. ADDENDUM (16:33 EDT): As a result of Greenland losing so much mass and ice, the geographic North Pole started in 2005 to move abruptly towards Greenland. This was reported earlier this week by Nature after the research was accepted for publication at Geophys. Res. Let. This entry was posted in Global Warming, Greenland, Ice Cover, Ice Island, Petermann Glacier and tagged climate, glaciers, Greenland, ice island, Nares Strait, NASA, Petermann. Bookmark the permalink. And what is your plan to play a part in addressing this question of Northern Greenland fjord ice? Right now, I am working with a second year undergraduate student trying to quantify the evolution of land-fast ice cover from SSM/I and MODIS satellite imagery starting 1978 and 2000, respectively for all coastal areas of North Greenland. Operation IceBridge and ICESat data may fill in smaller scale detail as needed, but these data are limited in the time period they cover. Those are all the funds that I have … and even those are leveraged off a different project. There are plans to go beyond that, but all field work has to go through a tense peer review process of diverse communities (oceanography, glaciology, geologist, mathematics, engineering, etc) that are all stressed to the extreme, but this is not a fun subject to contemplate about, so I stop. The sea ice of course provides stability for ice fronts. But given how back from the ice front Petermann Calved it would seem that it was thinning of the glacier that was more critical. If you examine several of the northern fjords from an oceanographic standpoint, which would appear to favor sea ice stability and which fjords are setup to allow warm water intrusion- Independence Fjord, Victoria Fjord or Sherard Osborn Fjord? My goals are a little more general in both time and space than the MODIS record at Petermann. I prefer systematic time series analyses by using metrics that describe properties of glaciers and metrics that represent some of the forcing of these glaciers. This is why I like Reeh’s work so much. Furthermore, I like to view North Greenland’s glaciers as a multiple input (many forcing processes) multipe output (many glaciers) system. So, I hypothesize that H1. North Greenland presently transitions from a state characterized by year-round land-fast ice to one characterized by mobile ice and H2. this regime change towards a longer mobile summer ice regime leads to more frequent flushing of remote fjord systems which impacts the terminal position and thus stability of several large outlet glaciers with extensive ice shelves. Hypotheses are provisional ideas to be tested, they are NOT statements of fact. Disproving a hypothesis, I find as rewarding as proving it. The proof of the pudding is in the eating, as Cervantes had Don Quijote say so eloquently. Nicely said, but I would still welcome any insights on the aforementioned fjords in terms of oceanography not glaciology, if you have any. Mauri: All those fjords are wide enough so that inflows and outflows are impacted by the Coriolis force (earth’s rotation) just as is the case for Petermann. This type of circulation (flow out on right looking seaward, flow in on left looking seaward) is most pronounced within about 100-200 meters of the surface. These Arctic waters are almost always near the freezing point and have little impact on the ice-shelf, however, the Arctic Ocean below this depth contains a huge reservoir of heat that enters from the Atlantic Ocean off Norway and Spitsbergen. These waters do enter Petermann whose fjord has a sill depth near 350 meters or so. Since I do not know the sill depth of the fjords that Academy, Ryder, and Ostenfeld glaciers discharge into, I have no way of knowing, if there is ANY Atlantic water in them. Please note, that none of this has anything to do with the flushing of these fjords of ice in the summer months which is a surface process that we can watch from satellites and aircraft surveys. If the fjords are narrower, then the outflow/inflow arrangement is more pronounced in the vertical, outflow at the surface uniformly across with compensating inflow at depth. The inflow/outflows are always much larger than the discharge of melt waters as these waters mix with ambient waters. Under these circumstances it is possible that inflowing waters can be raised somewhat over a sill, but it would require a large freshwater outflow event to trigger this “climbing over the sill” at the entrance of the fjord. If you let me take 1 vertical profile of ocean temperature and salinity with depth inside the fjord, then I can tell you how deep the bottom at the entrance of the fjord is … and vice versa. Without either, I can only read tea leaves and my guess is as good as yours. Very far from the topic but PII2012-A-1 is on the move again.